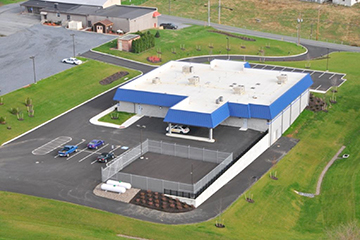 Hanover Engineering was retained by Clay Township to assist with the design and permitting of all site improvements required for the construction of a new 11,400 square foot Municipal Building located on Durlach Road in the community of Stevens, Clay Township, Lancaster County. The new building consists of a fully functioning municipal office and the Northern Lancaster County Regional Police Department, which includes two (2) federally compliant jail cells. Hanover Engineering prepared the plans, specifications, and bid documents for the site work improvements, as well as assisted the Township in the bidding and award of the contract. Hanover Engineering also worked closely with local architectural, mechanical, and electrical firms to prepare the required bid documents for the four additional contracts for the associated Architectural/Structural design, and Mechanical, Plumbing, and Electrical work. During the course of the project, Hanover Engineering assisted the Township with contract administration and overseeing the construction for all phases of the work.